Me and my son love Bhindi very much. Usually it used to be Vendakkai poriyal at home. After learning to make bhindi in microwave, I make these Masala stuffed bhindi quite often. After getting request for Bhindi Fry recipe, I googled and found sanjeev kapoor’s besanwali bhindi fry. It tasted good as it’s cooked with shallots and besan flour. 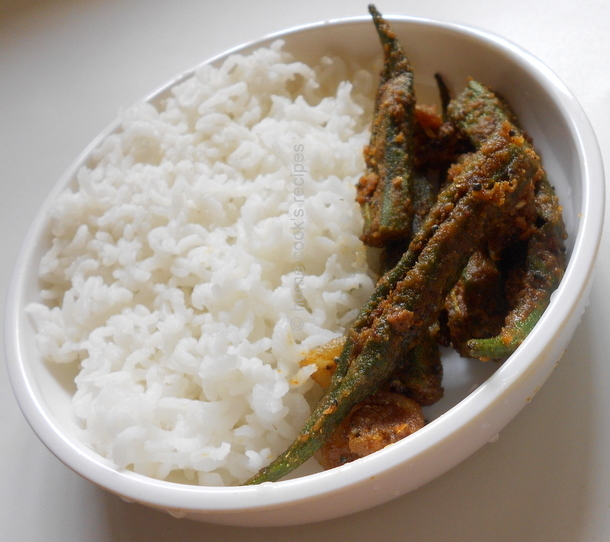 This Bhindi fry can be had with sambhar rice or Roti. Microwave oven makes Magic with Bhindi. I microwave chopped Bhindi pieces with a tsp of oil and microwave it on high for 4 minutes. Then i use it for vendakkai sambhar or vendakkai morkuzhambu. It saves time and oil. Choose small and tender Bhindi s. It cooks easily and taste’s good too. Wash the bhindis and wipe them with a clean cloth. Trim the heads of bhindis. Give a slit to all bhindis from top and end it just before its tail. Mix the powders (turmeric, sambhar, dhaniya, cumin, amchur, garam masala and salt) in a bowl. Fill the masala powders into the slit of bhindis with a help of a spoon. 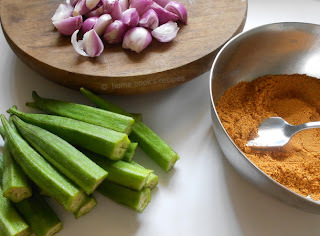 Half a spoon of masala’s is enough to fill a single bhindi. Heat Oil in a Pan, add mustard, let it splutter and then add curry leaves along with small onions. Once the small onions are almost cooked, add the besan flour and mix with the onions. Give a minute, till the besan flour gets roasted along with the onions. Now add the stuffed Bhindis to the pan and give a mix, lower the flame and let the bhindi gets cooked for about 5-7 minutes. Add little oil, if bhindis start sticking to the pan. Cook till the bhindis shrink and change dark in color. You can alternatively cook in microwave for easy job. After filling the masala’s into the slit of bhindis, place them in a microwave bowl. Sprinkle 2 tsp of oil over the bhindis and microwave on high power (900w) for about 4 minutes. After removing from microwave, Heat Oil in a Pan, add mustard, let it splutter and then add curry leaves along with small onions. Add little salt just enough for small onions. Once the small onions are almost cooked, add the besan flour and mix with the onions. Give a minute, till the besan flour gets roasted along with the onions. Then add microwave cooked bhindis and wrap them up with onions and besan flour. Serve with Roti’s or with Rice and Sambhar. Thanks Priti! This is so easy, hope you try it! 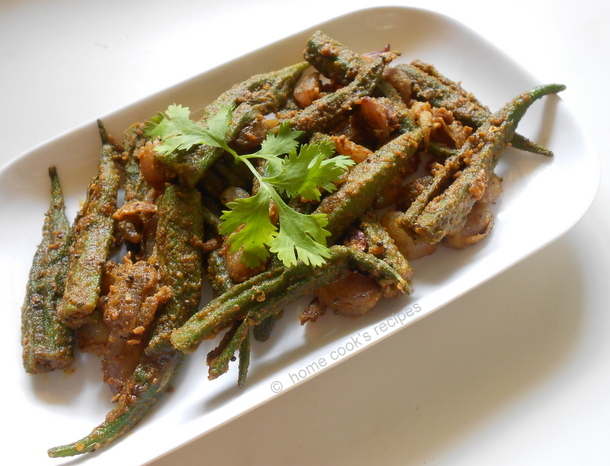 I too make this.Ur bhindi fry looks very delicious. love this recipe. looks so comforting. Bhindi Fry looks to be awesome. Excellent preparation with rice as a complimentary dish. Even i love bhindi as any form, super inviting fry..